And another all-Indian FTR750 podium sweep. Actually, all of the top 8 finishers were aboard FTR750s at the American Flat Track OKC Mile. DAYTONA BEACH, FL – June 17, 2018 – Defending Grand National Champion Jared Mees (No. 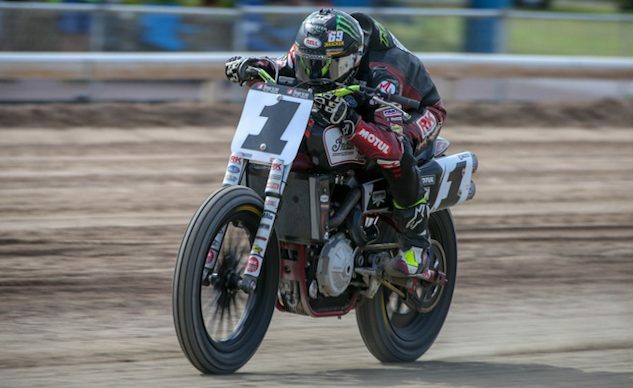 1 Indian Motorcycle Rogers Racing SDI Scout FTR750) was at his level best on Saturday night as American Flat Track returned to Remington Park for the OKC Mile presented by Indian Motorcycle of Oklahoma City. While a packed house looked on in awe, the 2018 AFT Twins presented by Vance & Hines points leader put on another impressive performance to take the win. While last year’s OKC Mile runner-up Brad Baker (No. 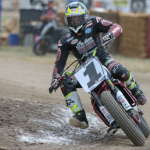 6 Indian Motorcycle Racing backed by Allstate Scout FTR750) limped off the line and dropped to the back of the pack, and the only rider to beat Mees’ in a straight fight all season long, Jeffrey Carver Jr. (No. 23 Roof-Systems of Dallas/Indian of Metro Milwaukee Scout FTR750), suffered a mechanical on the first lap, Mees immediately set about piling up an insurmountable advantage. He led by nearly three-quarters of a second following the opening circulation and continued to add to his lead by a similar margin each subsequent time around Remington’s state-of-the-art horse racing facility. Even after settling into cruise mode in the race’s closing laps, Mees still won by a commanding 12.839 seconds at the checkered flag. Despite lacking last-lap dramatics, Mees’ blowouts are made memorable by the history he’s making with each successive victory, and tonight’s win was no different. He’s now three for three at the OKC Mile and won four of the series’ run of five straight Miles that concluded at Remington Park. As a result, Mees now boasts 37 career victories, moving him equal with Kenny Coolbeth Jr. (No. 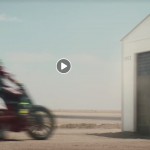 2 Nila Racing, Columbia Avionics Indian Scout FTR750) for fifth all-time. The win also gives him 10 career Mile victories, also elevating him alongside Coolbeth to rank eighth all-time in that category. Not bad for a rider once considered something of a Half-Mile specialist. Another rider who continues to break beyond preconceived notions of his talents is Henry Wiles (No. 17 Bandit Industries/Wilco Racing/Willy Built Indian Scout FTR750). Long considered a TT and Short Track ace, Wiles once again demonstrated his long track skills, racing to a clear runner-up result. Behind Wiles, Baker managed to claw his way all the way up to third after his opening lap disaster, but he was ultimately overhauled by teammate Bryan Smith (No. 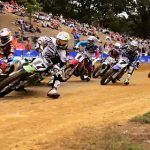 4 Indian Motorcycle Racing backed by Allstate Scout FTR750) for the position. Smith was in strong form throughout the day and looked to be on a collision course for victory with Mees in the lead-up to the Main Event. However, the former champ struggled to find his groove over the Main’s opening handful of laps of despite getting a decent start. Once he did rediscover his form, however, he managed to pick his way forward and secure the final spot on the box. Baker held on for fourth while an impressive Robert Pearson (No. 27 R/J Performance/Hite Trucking Indian Scout FTR750) completed the top five. Indian Scout FTR750-mounted privateers Davis Fisher (No. 67 Double D Performance/RMR Indian Scout FTR750) and Jake Johnson (No. 5 Estenson Racing/McCandless Truck Center Indian Scout FTR750) came in sixth and seventh place, respectively. Eighth place went to Chad Cose (No. 49 Indian Motorcycle of Oklahoma City Scout FTR750), who battled his way up from outside the top 10 to give his title sponsor a great deal to cheer about at its home event. Shawn Baer (No. 32 Schaeffers Motorsports KTM LC8 950) backed up last year’s breakthrough OKC Mile top five with another strong ride on the KTM this year. Works Harley-Davidson pilot Brandon Robinson (No. 44 Harley-Davidson Factory Flat Track Team XG750R) rounded out the top ten. Not surprisingly, Mees is well on his way to back-to-back AFT Twins presented by Vance & Hines titles. He currently leads the championship at the season’s halfway point by 59 points, 195 to Wiles’ 136. AFT Singles title leader Dan Bromley (No. 62 KTM North America/Bromley Motorsports 450 SX-F) expanded his own points advantage with a third victory on the season in an absolute barnburner for American Flat Track’s class of up-and-comers. Bromley came out on top of a star-studded, three-way scrap for the win that also involved 2016 AFT Singles champion Ryan Wells (No. 94 RMR/Al Lamb’s Dallas Honda CRF450) and the rider with the all-time win record in the class, Shayna Texter (No. 52 Husqvarna Motorcycles/JCS Racing FC 450). While Wells and Texter got away clean at the start, Bromley had to work his way into contention. He closed the opening lap seemingly mired in seventh, but made quick work of the riders separating him from first and second. He stormed up to third by the end of the second lap, was in second on lap 3, and took the lead on lap 4. While Bromley’s height can make the all-important Mile tuck difficult to execute, he found an advantage he could exploit by mastering a high line that no other rider could quite make work. That provided him the extra speed he needed running down the straights, giving him an answer to each of the many pass attempts Texter and Wells threw at him over the contest’s 15-lap distance. It still looked to be anyone’s race when the white flag flew, but Bromley was perfect on his final go-round. Wells and Texter, meanwhile, tripped each other up as they both looked to line Bromley up for one final draft pass. Texter passed Wells going around the final corner, but Wells squared her back up in order to reclaim the position. However, he caught a rut as he did so, forcing him wider than he planned and the two made contact. That stole their drive as Bromley blasted to the checkered flag unchallenged. Wells managed to hold on for second, 0.192 seconds behind the win, while Texter finished third, another 0.012 seconds back. Meanwhile, reigning class champ Kolby Carlile (No. 1 Estenson Racing/McCandless Truck Center Yamaha YZ450F) came out on top of a three-rider fight for fourth. Carlile edged Aussie Max Whale (No. 181 Don’s Kawasaki/Shark Leathers KX450F) – who made it five different makes in the top five – and Cory Texter (No. 65 CTR/Law Tigers Honda CRF450R) took home sixth. Unfortunately, it was a second straight year of OKC heartbreak for Kevin Stollings (No. 99 Roof Systems Honda CRF450R). 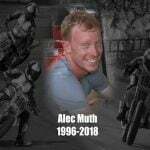 Last season, he suffered a mechanical DNF late in the race with a potential race victory in his sights. This time around, Stollings was DQ’d from the evening program after running an unapproved rear tire during his heat race. Prior to that he posted the fastest lap time for the class in both Qualifying 1 and Qualifying 2. Stollings wasn’t the only contender to be eliminated prior to the start of the Main Event; 2016 OKC Mile winner and 2017 runner-up Tristen Avery (No. 16 Ron Ayers/Mr. Sign Honda CRF450R) was forced out when his exhaust came loose on the race’s warm-up lap. 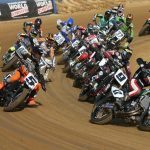 Following seven weeks of race action in eight weeks, American Flat Track will take a single weekend off before traveling to Lima, Ohio, on June 16 for the Indian Motorcycle Lima Half Mile. Live coverage can be viewed on FansChoice.tv beginning at 2:30 p.m. ET with Opening Ceremonies scheduled to kick off at 6:00 p.m. ET. Tickets are on sale now and can be purchased at Lima Tix.